One of the basic human needs for the sustenance of life is food. What is the genesis for the food we consume on a daily basis? In a word – agriculture. Agriculture and methods of planting, cultivating and harvesting have been around for centuries, from the dawn of mankind to the current age. There are various components of schools of thought which drive the agricultural industry, from environmental considerations to profitability to social entities. The industry consists of an exchange of trillions of dollars, representing 40% of the job market, 30% of greenhouse gas emissions and 10% of spending by consumers within the global marketplace. Advances in technology have enhanced the agricultural industry by encouraging developments of improved products from the farm to the table, increased productivity/sustainability and providing better efficiency for the agricultural resources available for customer consumption. We live in the age of drones whereby they are deployed easily to farming communities in order to take better inventory and monitor daily life on the farm. Livestock can even be designated with barcodes which the drone can scan in order to track migration of the animals on the farm, eating habits, growth and overall general health. 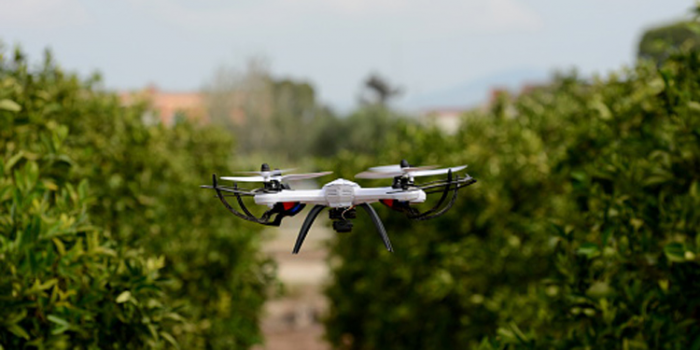 Drones can be used to relay messages or video to the landowner to track the growth of fruits and vegetables, to scan data regarding the best conditions, to plant seeds and to harvest the crops. Weather data can be exchanged to monitor the agriculture for drought conditions, excessive rains, winds and temperature – all natural elements which can make or break a farm if conditions are not optimal. The ways in which the agricultural industry will thrive under these technological advances will revolutionize the agricultural industry with progressive and substantial commerce. A recognition of the agriculture of precision will be prevalent with the optimization of economic advancement through the use of information technology, which will improve this industry of daily consumption significantly for better growth and expansion of global food supply. By increasing productivity, the scarcity of goods will decrease, resulting in lower costs for the consumer. In addition, costs will be controlled by eliminating many of the multiple challenges farms face with equipment maintenance, consultants, overhead, etc. Farms will experience more connectivity with each other through real-time exchange of data and monitoring of the industry. It is predicted there will be 75 million devices on farms being used for IoT by the year 2020. And it is expected that 4.1 million data points will be generated on a daily basis in 2050. Cognitive devices may prove challenging for the agricultural industry, however. The ease of data collection through the use of handheld devices such as iPhones and tablets through the rapid exchange of data will result in benefits for the agricultural community as well as the “farm to table” public enjoying the bountiful harvest from the efficient and robust production of goods directly from the providers. Agriculture can reap many benefits through the utilization of progressive technology through IoT. These technologies can be deployed in order to select the crops with the most growth potential for specific areas or climates. Weather patterns can be researched and soil samples taken to determine the appropriate seeds which can be cultivated to their maximum potential on specific farms. Also, the types of insects which target specific crops can be researched for patterns of infestation, thus allowing farms to take the appropriate precautions with their crops. And consumer trends in tandem with marketplace demands can assist the farm in calculating profitability. Chatbots will be the trend in agricultural communities as they will serve as “real-time” assistants providing instantaneous interactions with their users. These components of artificial intelligence are personalized based upon the users’ specific needs. Chatbots are able to comprehend language and can be programmed for agricultural terminology allowing the user to have an assistant at the ready for help accessing immediate data. Currently, you will find chatbots in the realms of travel, media and retail. However, they can be readily modified to assist the agricultural community with specific farming needs and advisement. As mentioned earlier, drones will be used on a regular basis to collect farming data. The Watson IoT platform will utilize technology by integrating machine learning capabilities and joining them with data derived from the drones. The everyday entities of management systems will be modified and integrated as systems of artificial intelligence. Data can be pulled from various sets of sources, albeit it historical or archived data, current reports of weather, research of soil samples or consumer data, to name a few. AI will change the modern agricultural community as we know it today, to the progressive and profitable business through which to better serve the consumer. In the last 50 years, as citizens have moved from farming communities to urban areas, there has been a significant decrease in the traditional farm of days gone by. It is predicted that in just a few decades, over half of the world’s population will reside in urban areas. As such, if no one is residing in rural farming areas, there will be but a few members of the population working in the agricultural industry. To solve this discrepancy in a lack of workforce on the farm, the cognitive systems will be implemented at just the right time in order to best serve the needs of agriculture. Through this innovative technology, there will not even be a need for someone to be on the land being cultivated. Actions and decision could occur remotely, business decisions could be made instantaneously, challenges could be recognized and more informative decisions can be made and executed, thus avoiding any potential crises. As an example, visual recognition APIs and the IBM Watson IoT platform joined with Aerialtronics to create commercial drones to capture real-time data and images to provide progressive agricultural analysis to monitor crops, as well as the specific seeds used for planting and the health and life cycles of specific plants. As such, these AI tools will streamline the agricultural industry, and in turn, save crops from destruction due to pestilence or weather conditions which can prove fatal to crops. And most importantly, these AI tools will drive efficiency and profitability. The agricultural industry is long overdue for a revolution in productivity and profitability. With progressive innovations in the realm of technology, specifically IoT, agriculture will grow like never before with increases in marketable livestock and produce through which the entire world will benefit.